WASHINGTON (March 11, 2013) -- Steamed opakapaka, scallops, profiteroles and stress were on the menu at the 2013 Military Culinary Arts Competition here. 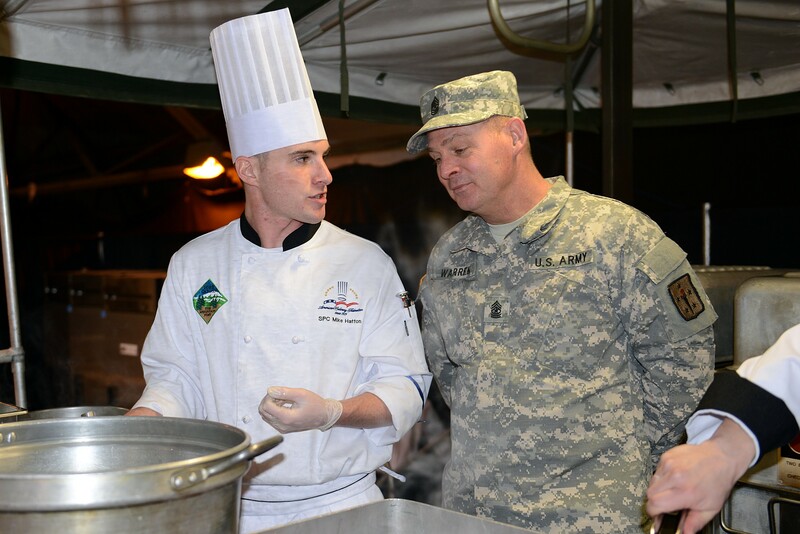 The competition, now in its 38th year, runs March 2-15, at Fort Lee, Va., and pits military food service professionals from all services against themselves and each other to show off their best cooking skills. Spc. 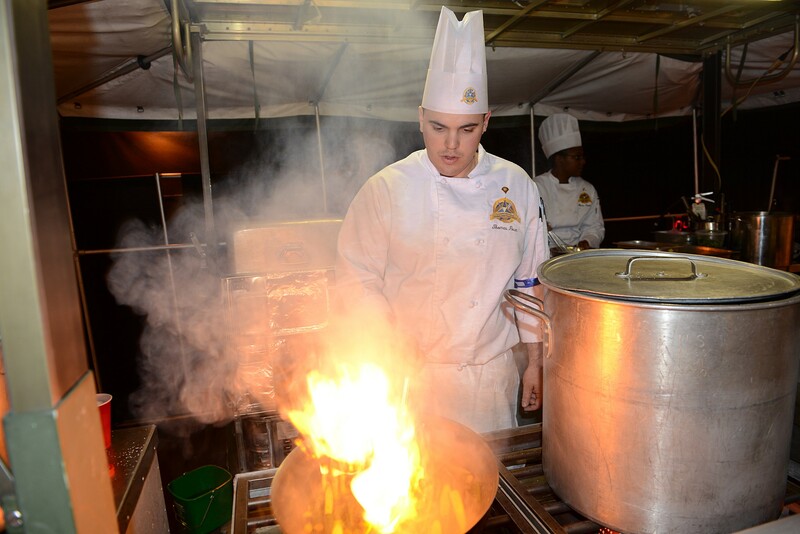 Thomas Poux, from Fort Hood, Texas, sautes zucchini at the 2013 Military Culinary Arts Competition at Fort Lee, Va. Inside the field house here where the competition was held, two mobile Army containerized kitchens, stainless steel boxes, like trailer homes outfitted with everything needed to cook hot meals for an Army in the field, stood against one wall. On the other side of the field house, a row of 10 identical kitchens with large digital timer clocks on the refrigerators stood ready to host a variety of young military chefs in competition, each eager to show judges from the American Culinary Federation that they were on top of their game. "What they can expect here is enhanced professionalism, enhanced culinary skills, more developed techniques in the arts of food preparation and food sanitation, and the credentials that will allow them to be recognized in the private industry," said Lt. Col. Luis A. Rodriguez, director of the Joint Culinary Center of Excellence at Fort Lee. "Also, they are given the opportunity to expose themselves outside the garrison environment, within a competitive environment." Over at one of the mobile field kitchens, Soldiers from Fort Carson, Colo., prepared to serve meals to 60 visitors to the competition, visitors who would actually pay for their meals, and who would eat as paying customers. Nearby, another identical field kitchen was manned by Soldiers from Fort Hood, Texas. Spc. Kollin Mullins, with the Fort Hood team, served as expeditor on a six-person team of servers. "I make sure the plates get out to the customers in a timely manner, and at the same time make sure all the components are on the plate," Mullins said. Coming out of the Fort Hood kitchen was a squash soup, a grilled and marinated halibut fillet, and a layered dessert with orange chiffon cake, mango mousse and raspberry gellee. When customers had been seated, and were awaiting their meals, Mullins stood near the kitchen waiting for food to be plated and verified that it looked good before handing it off to his team of servers to move out to the diners. Each server, he said, had two tables. "If one of them gets down, or somebody is messing up, or needs help, if another one can help they go help," he said. Mullins is a 92G himself, and does more than just expedite. Last year he was at Fort Lee to participate in the ice carving competition, he took home a bronze medal. But he cooks too, especially when he's back at home and part of the Fort Hood Culinary Arts team that helps train other 92Gs there to do things beyond what they do in the dining facility, known as a DFAC. "We train the Soldiers on the culinary side of being a 92G, not just working in the DFAC," he said. "We train them to do better stuff." Being at Fort Lee for the culinary arts competition puts everything he knows to the test, Mullins said. At the competition, he and his team can show off their A-game. "This is a competitive training event," he said. "A select few get to do this, and it's a great thing to be here and do what we do. It shows not only what you can do in the Army as a 92G, but that there is more to being a 92G." At Fort Lee, Mullins said, there is also an opportunity to learn, from nearly everybody he encounters. "You can go from the highest ranking noncommissioned officer or officer, down to the lowest private, and you can learn anything from any one of them," he said. "Nobody knows everything, but everybody knows something." Spc. 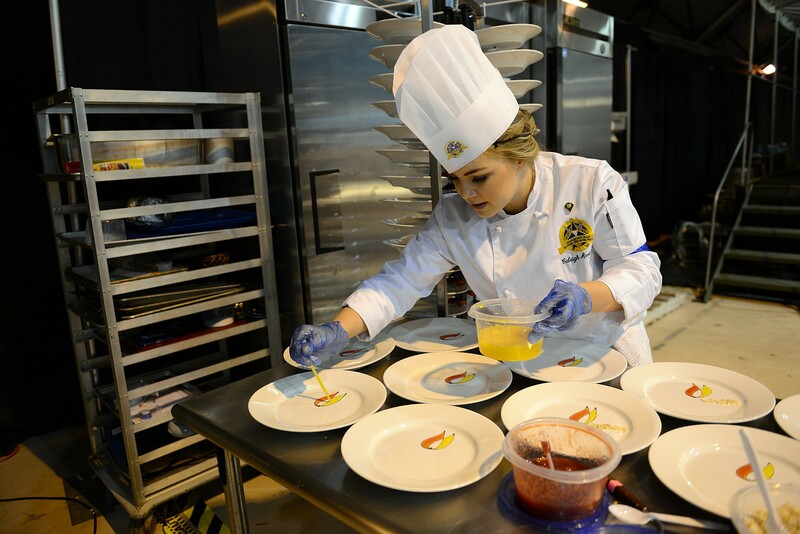 Caleigh Arrington, from Fort Hood, Texas, prepares a desert at the 2013 Armed Services Culinary Arts Competition at Fort Lee, Va.
Now 18 years in the Army, and originally having served as a communications specialist, Army Staff Sgt. Brian S. Gerstemeier with the Fort Carson, Colo., team found himself making desserts for the lucky 60 guests of their team. "I'm filling pistachio profiteroles with a pastry cream," Gerstemeier said. "They're made with butter, water, flour and salt, with ground-up pistachios. I boil the water and butter, add the flour and salt mixture at once, and stir while it's on the fire, and mix into a ball, then I bring it to the mixer and beat all the heat out of it and then add eggs and pistachios." The work looked delicate. For each tiny puff of pastry he'd baked, he had to puncture it with the tip of a pastry bag and fill it with the crème, so it could later be plated with other elements of the dessert. Together, the team served an appetizer with scallops and a pea puree, and an entrée with veal, purple potatoes, and asparagus. Gerstemeier said competitions like the one at Fort Lee come down to one thing: "time management, bar none. You have to manage your time. If you don't space out your cooking times, if you don't alternate, and work with the other team members, you won't be able to get where you're going." Across the field house, individuals and two-person teams competed against stringent standards and an unforgiving clock in various competitions that tested everything from their personal skills with the knife and poultry to their ability to design a healthy meal. Sgt. Rena Adonis, stationed at Schofield Barracks, Hawaii, came to the competition with Joint Team Hawaii, and competed in the hot food nutritional category. "The entire dish had to be under 1,000 calories," she said. Included in that was ox tail soup, steamed opakapaka, a fish, with brown rice and sautéed broccoli, and "ying and yang" Asian pears with a cherry compote. The three-course meal for four people had to be completed in 2 1/2 hours. "Coming down to the wire, I definitely started to feel everything coming through and I started pushing more," she said. "We placed high silver. It's my first time in this competition, and I'm pretty excited about that." Adonis, who is originally from the Caribbean Islands, said that special attention needs to be paid to portions of food and ingredients used when preparing a meal that has to meet specific nutritional specifications. "Cooking regular meals, you just add a little of this, add a little of that," she said. "We don't really measure stuff. But for nutritional, for our fish for instance, we had to make sure our portion sizes were correct, it had to be three ounces, exact. We were also using brown rice, and there had to be a certain amount of rice on the plate. And with all your sweeteners, you have to use sweeteners, like Stevia or natural honey. You have to think it through when you do a category like this." This is Adonis's first year at the competition, and she said she's learned that patience is key to success at the event. "A lot of times, especially working with the people I work with, we work with them 24/7," she said. "People are going to get on your nerves, because you are in close quarters, and you're trying to get things perfect, and you are frustrated. Patience is key in this entire thing." In preparation for the competition, Adonis said she and her team trained for three months, sometimes as many as 12 hours a day. "It's a lot of long hours," she said. "And a lot of us on the team are novices. We don't have any professional certifications or anything, a lot of us are mess hall cooks, dining facility cooks." Coming down from nearby Washington, D.C., to participate in the competition was Air Force Staff Sgt. Ghil Medina. He spends most of his days cooking for the Secretary of Defense at the Pentagon. Medina competed in the K1 "professional" category at the competition, wowing judges with something he said is native to his home in the Philippines, including chicken relleno, mixed vegetables, and garlic fried rice with adobo sauce. "I went back to my roots," he said. "It's like Philippines in a nut shell. I feel great about my food today. It represents me. It's the thing I always eat every day, and I'm really proud the judges loved the food and are appreciative that I served them something outside the box." He earned a silver medal for his dish. "There's a lot of things the judges are looking for," he said of the competition. "There's sanitation, organization, and the way the work flows. And most importantly, the flavor and the execution of the dish. The judges need to see the amount of skill in a plate, and how you execute it." Medina has been in the Air Force for six years now, has been cooking the entire time, and says he's "right in the middle" when it comes to his skill level. "I'm training younger Soldiers and Airmen, and I'm transitioning to be a more professional chef," he said of himself. When he goes back to Washington, he'll be back cooking again for Secretary of Defense Chuck Hagel, along with the 20 other cooks that work in the mess there. The secretary, he said, eats simple, and leans "toward the healthy side." But despite cooking for the highest levels of those in the Department of Defense, Medina said he just loves to cook, and one day would have no problem returning to an Air Force base, such as Lackland Air Force Base, to cook again for other Airmen, even basic trainees. "I would love to go back," he said. "The things I've learned from the great chefs at the Pentagon, I would bring it back down to the Airmen. I am passionate about cooking, because I love to make people happy. That's the main thing." This year's competition at Fort Lee was smaller than in other years. Budget constraints have meant that not everybody who wanted to attend could attend. Additionally, some of the events that have been available in years past were no longer present. This year, for instance, there was no ice carving competition. Budget constraints, Rodriguez said "affected us significantly in terms of how many events we put into the competition." Still, he said, the competition is robust enough in scope, with the right events included, to continue to be an American Culinary Federation-sanctioned event. And most importantly, Rodriguez said, the competition has a significant learning element. "We kept the training portion intact," he said. "That ensures that participants could enhance their skills by participating." While the food on display at the competition is not something you'd usually see in a dining facility, Rodriguez said, the skills service members bring there to compete are on display at chow halls across the U.S. military, and that's what's important. "All the ingredients, the procedures, the techniques are the same ones that are applied in a garrison or field environment. So in a garrison environment, you will see the food preparation and the techniques are the same," he said.